Queenstown is one of the beautiful and scenic towns of New Zealand’s South Island that is less than an hour’s flight from Christchurch. There is plenty to see and do in Queenstown, whether you’re a thrill seeker looking for your next rush, or you fancy yourself to be a bit of a foodie and want to find the perfect glass of red to go with a top-notch meal. Queenstown is the perfect place to unwind, relax and enjoy a wide range of activities and stay in some of the most stunning accommodation options in New Zealand. There is certainly plenty to do in Queenstown, but if you’re staying for a while, you can also take advantage of a number of incredible day trips available from the town. Wanaka is a lovely lakeside town that is approximately an hour away from Queenstown. If you’re a bit of a nature lover and want to see some of the beautiful sights New Zealand has to offer, Wanaka is a must visit. Eco Wanaka operate sightseeing tours that take you to see mountain views and lake landscapes like no other. This is also the perfect town to visit for the day if you’d like to do some hiking, fishing or climbing. Hiking or climbing at Mt Aspiring National Park is a must when visiting Wanaka. Enjoy a nice glass of wine? Then you must visit Central Otago. This region is wine central and is approximately 50 minutes away from Queenstown. With more than 80 wineries in the area, you can enjoy visiting numerous cellar doors and accompany your wine with tasty al-fresco dining options with some of the country's freshest produce. The local Pinot Noir is well-known across New Zealand and beyond, and is definitely one of the wines you must try whilst visiting. Central Otago is also the home of the summer fruits such as cherries, apples and apricots, which will go down well alongside your cheese platter and matching wines. Bit of a movie buff? The Lord of the Rings movies, and more recently The Hobbit films, were filmed predominantly in New Zealand. Because of their popularity, there are now scenic Lord Of The Rings tours which depart twice daily from Queenstown. Take a journey to Middle Earth and feel like you’re a part of the legendary books and movies on the stunning day tours throughout many scenes where the movies were filmed. Local guides have a true passion for the area, so will be able to provide you with the most details about the town and landscapes not known anywhere else. If you’re looking for some of the best hiking trails in New Zealand, you cannot miss the opportunity to visit Glenorchy. 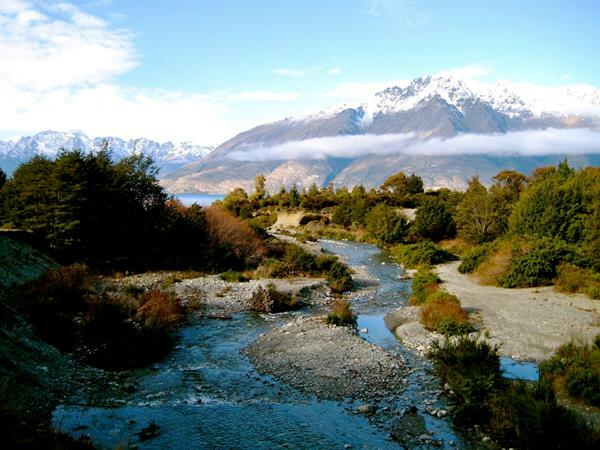 Located just 45 minutes away from Queenstown, Glenorchy is a true outdoor enthusiast’s paradise, with an abundance of mountain ranges, lake landscapes and native beech forests to see. There is also the opportunity to take on kayaking and jet boating for something a little different and adventurous. Whether you want lunch or dinner, you can enjoy splendid views overlooking Lake Wakatipu and the Remarkables range by riding the Queenstown gondola. High in the mountain you will be able to have a meal at Stratosfare Restaurant and Bar. Not only are the sights incredible, but you can enjoy high quality fresh seafood and prime meats at their all-you-can-eat buffet. The restaurant also utilises tiered seating, so no matter where you are sitting, you will easily be able to enjoy the view. Complete your meal with a drink from the fully licenced bar. If you’re looking for a day trip that has a bit of everything, the Milford Sound Tour is the trip for you. The day starts with a 40 minute flight from Queenstown to the stunning Milford Sound, during which you’ll be treated to a number of scenic views from a bird's eye perspective. You will be able to see views of Fiordland National Park which consists of beautiful mountains, fiords and lakes. Once you arrive in Milford Sound, you will then board a boat to enjoy a 2 hour cruise of the area. You’re then whisked back into the air for a flight to Glenorchy, followed by the Dart River jet boat safari for an hour. A 30 minute native forest walk and 4WD coach trip back to Glenorchy finishes up the tour, taking you back to your destination. You will certainly see quite a few sights and enjoy many a photographic opportunity on this tour. No doubt, you’ll have an easy time getting to sleep that evening. For a full day tour that is suitable for the whole family, the Paradise Valley tour is a great option. There is flexibility to create the perfect day tour for the whole family, depending on what your interests are. Whether it’s hiking, taking photos, or simply seeing some of the sights from the Lord of the Rings films, this tour can be altered to get in more of the activities you want. Optional walks are available, but the key to this tour is a day enjoying the beautiful sights and relaxing whilst looking at the scenery. Great food will be enjoyed and it’s certainly one of the best tours to take in the sights, especially if you have children in tow. It is no surprise why many people choose to visit Queenstown. With so much to do in and around the area, there’s never a shortage of activities. Whether you’re an adrenaline junkie, a wine lover or enjoy your fair share of movies, there is certainly a day tour from Queenstown to please every kind of taste.